Foreword by Dr John Eglin, Professor and Chair, Department of History, University of Montana and author of Venice Transfigured. The Myth of Venice in British Culture, 1660-1797 (2001). Venice is a glory of human achievement, and this book is the human-centered defense that the city deserves. Mick Hume, columnist for The Times (London). 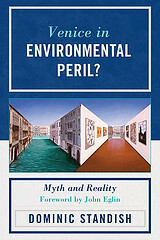 …A groundbreaking book for understanding the politicization of the environment. Dr Frank Furedi, professor of sociology, University of Kent. Standish has succeeded in locating the transforming history of Venice as metaphor for Western preoccupations and self-understanding – from the highest realization of mercantile politics and republican statehood through romance and degenerate decadence, to its contemporary invocation as a symbol of unease and discomfort with the achievements of modernity and the attempt to master nature. This is an important contribution to the critique of the diminished political and historical imagination that underpins the construction of climate change as an insurmountable social problem. Dr James Panton, lecturer in politics, St John’s College, University of Oxford. Standish’s project is to re-conceptualize Venice’s historic relationship to human endeavor and to remind us that it was the energy and innovation of Venetians themselves that made Venice great. He succeeds admirably. His book is a valuable contribution not only to Venice’s future but to the wider debate on the efficacy of human intervention. Alan Hudson, director of Leadership Programs for China, University of Oxford. Elisabetta Gasparoni has written a very perceptive and thorough review of the book. Dominic Standish, Ph.D., is British and lectures for the University of Iowa at its CIMBA campus in the Venice region of Italy, where he has lived since 1997. For additional resources and updates about issues examined in the book see http://www.dominicstandish.com. Published in January 2012 by the University Press of America. ISBN 978-0-7618-5664-1 paperback. eISBN 978-0-7618-5665-8 electronic. Price US$35, UK£21.80, Euro €25. As a frequent visitor to Venice this book provides both an interesting alternative view to the classical, mythical and romantic view of the city, which often concentrates on the static and romantic view of Byron and Ruskin, together with a call to regenerate the city with a forward looking and dynamic future. Standish provides a useful history of the impact of the convergence of the global environmental and local conservationist movements and how they have in recent times led to the opposition to and construction of myths concerning the new mobile dams which will help provide protection for the city and Lagoon from the sea. By examining the distant and recent history of Venice and its many myths in the context of a study of risk and resilience he provides, in a way that can be generalised, a pointer to how the problematic and modern trends to align society with nature needs to be questioned. If we are to welcome modernity through bold engineering projects as well as have a positive cultural attitude then problems need to be seen as opportunities to be embraced and Standish shows we need not simply adapt to what many now see as our accommodation within nature. I for one will never see Venice in the same light. As a bit of a Venice obsessive, I’ll try to get a copy of this. Grazie!